246 pages | 17 B/W Illus. 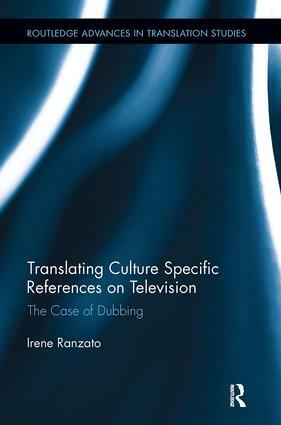 Translating Culture Specific References on Television provides a model for investigating the problems posed by culture specific references in translation, drawing on case studies that explore the translational norms of contemporary Italian dubbing practices. This monograph makes a distinctive contribution to the study of audiovisual translation and culture specific references in its focus on dubbing as opposed to subtitling, and on contemporary television series, rather than cinema. Irene Ranzato’s research involves detailed analysis of three TV series dubbed into Italian, drawing on a corpus of 95 hours that includes nearly 3,000 CSR translations. Ranzato proposes a new taxonomy of strategies for the translation of CSRs and explores the sociocultural, pragmatic and ideological implications of audiovisual translation for the small screen. Irene Ranzato is a researcher in English language and translation at Sapienza University of Rome, Italy. She has a PhD in Translation Studies from Imperial College London, UK.